Will you be traveling out of town? Will you be seeing friends and family? Have you finished your shopping? Now when I ask that question, the first thing we probably think of is famous song sung in 1952 by a 13 year boy, named Jimmy Boyd who told us about how he saw his mommy kissing Santa Claus. The song was commissioned by Neiman Marcus to promote their store’s Christmas card that year. But the Catholic Church in Boston condemned the song for mixing kissing and Christmas, but little Jimmy met with the Archdiocese and explained that kissing under the mistletoe has been a longtime Christmas tradition. After the meeting the ban was lifted, and the song went on to become the year’s #1 hit. It has become a classic—sung by many famous artists over the decades. And even made into a movie a few years ago. Now regardless of what you think of the song, you’d have to admit, that it’s a clever idea. Clearly Santa is just Daddy in disguise, but to little eyes this would be a scandal. Let me make some recommendations of who you should kiss. Here’s my top 4. That’s just a no brainer. If your mom’s still alive, kiss her. I love kissing my little girls they’re so cute and cuddly and kissable. Maybe you say “But my kids are in their 60s. They’re not cute, cuddly or kissable.” Well kiss them anyway. This is something you should do all the time. I read recently that the way a wife can keep her husband loyal is by giving him a 6 second kiss every morning before he goes out the door. Try it this week. You may gross your kids out. You may want to brush your teeth before he goes to work. But kiss your spouse. 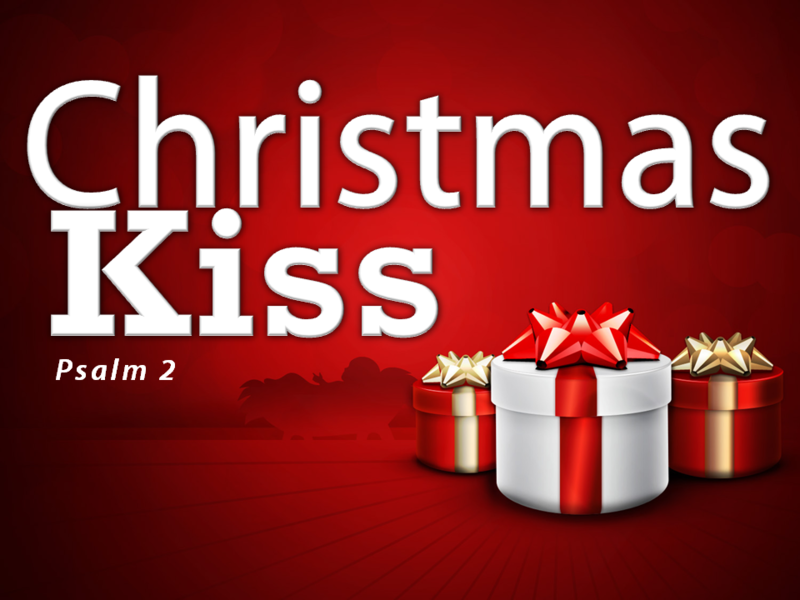 This brings us to the #1 Person you should kiss this Christmas. And that is the Person of Jesus Christ. Kiss the Son of God. If this sounds a little strange, it’s because we need to understand Ps. 2. This was written 1,000 years before the first Christmas—by David the great King of Israel.